Thomas the Train Birthday Party Games, Ideas, and printables! This activity is both a craft and a game. You’ll need enough medium size cardboard boxes so that each child receives one. Fold the top and bottom inside so that it creates an open ended box in which the children can step into and hold the box around their waist. Let all the projects dry and at the end of the party have all the children get into their train box and join together to form a train. You can then chug along together through the house, around the yard, or (if you’re on the brave side) around the neighborhood. You can easily turn this into the follow the locomotive game below. Played just like follow the leader. Line up the children and have the birthday child start as locomotive (line leader). Everyone must follow behind the locomotive and do as he/she does, such as skip, bunny hop, crawl, spin, walk backward, etc… After a minute or two blow the whistle (if you don’t have one you can just yell switch) and the caboose (last person in line) gets to come up to the front and be the locomotive. Everyone else stays the same. Play until everyone has had a chance to be the locomotive. This game is played just like the traditional “Simon Says” but instead of Simon you say “the conductor says”. This would be really cute if you had a conductor hat, but you don’t have to. Line the children up facing the conductor. The conductor gives instructions such as “touch your nose”, “spin around in a circle”, and “reach for the sky”. If the conductor starts these statements with “the conductor says” the players have to do it, but if he doesn’t begin with the conductor says then they don’t do the action. 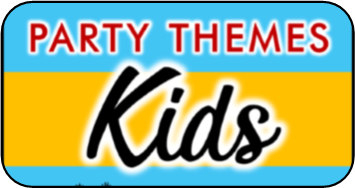 This is a fun seek and find party game perfect for younger children. You’ll need print out of train carts. Hide the trains all over your playing area and have the children look to find them and line them up in the right order (locomotive first, caboose on the end). This is non competitive, and kids have a blast hunting down all the train carts. For extra fun have the child call out “Choo, Choo” every time they find one! Create train tracks on the floor all through your playing area with easy to remove masking tape or painters tape. Have the children lone up on the tracks like a train and chuga chuga down the tracks until they arrive to the final destination. This could be the cake and ice cream table, favor / goodie bags, whatever you want. To make the game more interesting include detours, forks, signs, etc…along the way. They can sing a fun song along the way or just make fun train sounds, it’s up to you. 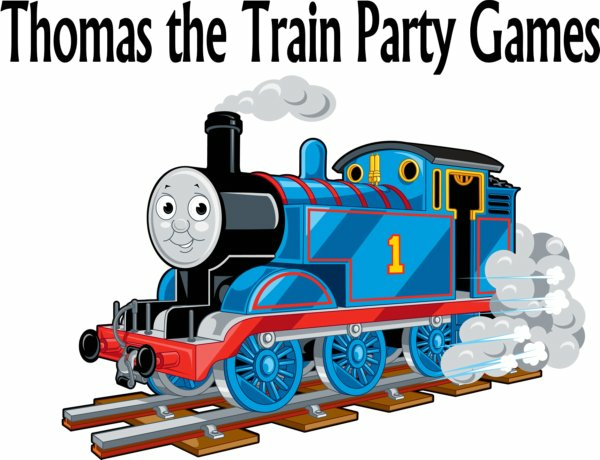 This is an outdoor Thomas the train party game. Divide the players in half and assign one half to be the “locomotives” and the other half to be the “Caboose’s”. Pair up each locomotive to a caboose. On the start of go the caboose must chase after his or her locomotive and try to attach by holding onto their shoulders (or waist). The locomotives must try and escape by twisting and turning to get loose of their caboose. Every few minutes blow the whistle and have the cabooses become the locomotives and vise versa. 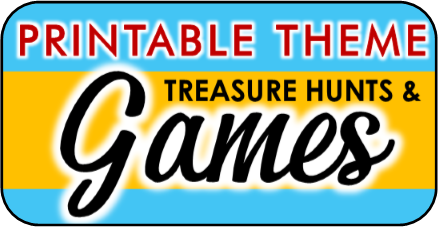 The game is great for fun and letting loose all that party energy. This game is played just like the classic pin the tail on the donkey. 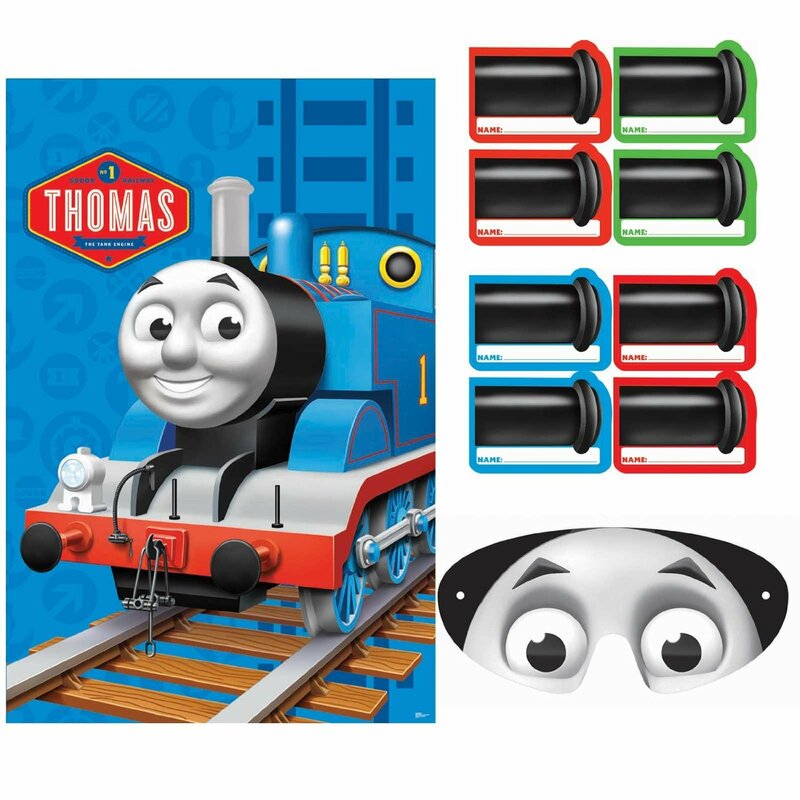 Each child is blindfolded (with an included Thomas the train face mask) and must try and stick his or her smoke stack sticker in the correct position on the included Thomas the train poster. See Amazon.com reviews for this game! What I love about this piñata is that it doubles as a party decoration, and then later it is perfect for hanging up in the child’s room. 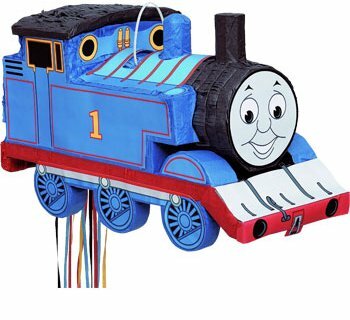 No need to smash this adorable Thomas the train to bits with a bat, it’s a pull string piñata! Children take turn pulling ribbons until finally the correct one is pulled and releases a trap door in which all the candy falls out from. This I believe is a great alternative to the pinata’s that must be busted with a stick or bat, I’ve heard so many horror stories about these. Nothing kills the party like busted out teeth or bloody noses.